BBC NEWS | UK | Magazine | Berry good for you? Slender celebrities have been singing the praises of goji berries and now Tesco is stocking them. Does this "miracle" Himalayan fruit match up to the marketing hype? The goji berry is the latest so-called super-food name to trip off the tongue and into the mouths of health-food evangelists. Small, red, dried, and a bit like a savoury cranberry, the nutritionally-rich fruit is making the leap from specialist store to supermarket. Already popular in the US, celebrities like Madonna, Liz Hurley and Mischa Barton are said to munch them for their rich properties. But there's no messy peel, and the berries are so light that a "daily serving" is just 10-30 grams. The hype machine calls them "fruit Viagra", "cellulite-busting" and claims one pack will have you "jumping for joy". A more sober scientific explanation says the beta-carotene in the fruit is thought to help fight heart disease, defend against cancer and protect skin from sun-damage. The berries are a good source of B vitamins and anti-oxidants - which may help protect against the fallout from chemical reactions in the body. "It sounds like quite an amazing berry," says dietician Jacqui Lowdon, of University Hospital, Cardiff. "But a lot of things like that are a novelty." "A serving of one berry is not going to turn your life around. That requires a combination of things: overall weight, attention to fat intake and types of fats, fibre intake, vitamins and hydration. It's an overall package." But as one of your five portions of fruit and veg a day, Ms Lowden gives gogis the thumbs up, saying a "novel alternative is great". But will the average shopper be cast under the goji spell? Organic grocery shop Fresh & Wild, in London's Notting Hill, is hardly a reliable barometer of public opinion, but if a health trend is awakening, this is where the pulse can be felt. "Where are the goji berries?" is the most-heard phrase from customers as they come in to stock up on healthy goods. From £1.99 for a 60g bag of the shrivelled fruit, to £14.99 for the maxi size, goji berries are not cheap, compared with a home-grown apple or an orange. 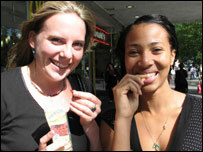 But the packets, berry bars and muesli have been selling by the trolley-load in recent weeks. "They've been flying off the shelves," says manager Alan Green, who likes them mixed with nuts and seeds as a snack. 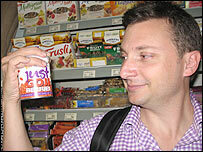 At the shelf stacked with goji produce, Jonathan Foreman, 40, from London, is picking up a couple of packets. "They're nice with cereal, crunchy, not that sweet and a little bit like a cross between a raisin and a dried strawberry or raspberry," he says. He likes the taste and nutritional value, but adds: "A lot of people believe that they give a huge boost to your libido, but I certainly haven't experienced that." Gojis, or wolfberries, are grown on vines in China, Mongolia and Tibet, where they are also drunk in juice form. But isn't their feel-good factor somewhat compromised by the fact they have to be carried thousands of miles to reach their Western market? After all, aren't "food miles" every bit as worrying these days as poor diet? 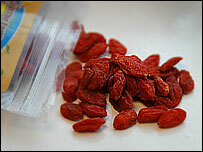 Stockists are armed with a response to this accusation - saying the dried fruit is shipped, not flown. Whether that popularity grows will depend not just on how health conscious people rate them, but on their taste for the masses. Outside Tesco, after a slow start, nibbling gingerly on the berries, Katasha Rose's, 23, and Sarah Jaques' verdict is strong and unequivocal. Noses wrinkle as they chew and Sarah, who is not a berry fan, rejects them. A more enthusiastic Katasha says: "They taste like tea." Would goji berries make it into her shopping basket? "Yes, if they were cheaper," she says, "and tasted better." The goji sounds like an expensive fad to me. Blueberries and prunes also contain large amounts of antioxidants but don't tell the celebrities. I don't want their prices to go up! I'm a firm believer that if "exotic" fruits were worth the effort of importing them, we'd have been enjoying them as long as we've been enjoying oranges and bananas. I work as a cancer research scientist. It has been clinically demonstrated that high doses of vitamin C (>300mg a day) correlate to increased levels of bladder cancer. Apoptosis- the method by which faulty cells commit suicide is controlled by free radicals which are blocked by anti-oxidants. Any claim that this fruit is "anti cancer" are completely unproven and potentially fraudulent. I'm curious what published scientific evidence proves high doses of vitamin correlate to bladder cancer. There is none: in fact, there is a wealth of literature to the contrary. Considering today's rate of cancers, obesity and general bad health, mainly due to stress, pollution, junk food and synthetic chemicals that we ingest via our food and cosmetics, any form of fruit or vegetable that provides high doses of natural vitamins should be welcomed, not attacked or discredited. The trouble with science today is that it tries too hard to emulate nature, effectively creating synthetic versions of things that Nature has so generously given us - in this case in the form of these weird berries! They grow very easily in the UK - and are naturalised around Suffolk and Norfolk. You'd think someone would have cashed in on the fad and started cultivating them over here - unless of course it's just that they're from an exotic location and cost a fortune that makes them sell so well. I have just got back from Malaysia where I came across these berries as part of a steamed chicken and ginger dish served at a side of the road stall. The dish was basically chicken, ginger, palm sugar and the berries steamed in a foil bag containing chicken stock so they were rehydrated and tasted nice and juicy. Yum!!! In China, where all foods are considered to have medicinal properties, the gojizi are traditionally used as a medicinal ingredient that is steeped in tea and simmered in soups. They are not eaten directly from hand to mouth...ever. I was brought up consuming the 'kei-chee' (how it is pronounced in Cantonese) for as long as I can remember. We usually add it in our soup or stir-fry greens or with steamed dishes. It always tickles me when the Western world discovers a regular food item from our menu and turn the discovery into some food hype/fad and makes it sound all too exotic. I hope this will get more mileage from my poor old tired body. If a fad makes people eat more fruit and less lard, then frankly it's a good thing. Apricots have beta-carotene and iron and taste nice, dried or fresh!